We started work on the garden in Autumn 2000. The total site area including wild flower meadows is approximately 8 acres. 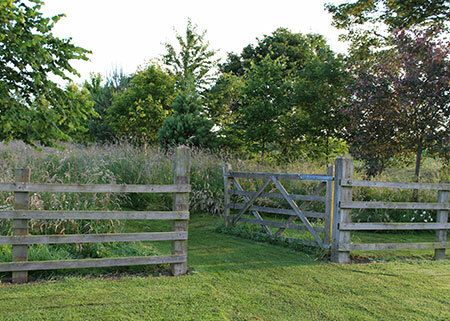 There are three definitive areas in the garden. During the construction of the house approximately 600 tonnes of sub soil and rubble was moved from the site to create a new terrace and improve the levels for the house. This could be described as a garden of rooms and is in the vicinity of the house. The design is based on the dimensional lines of the building. With hedges and pathways lined up to walls, windows and corner axis. This was the site of great aunt’s garden. Solar garden – created in 2013 with the installation of a 4KW 16 Panel solar power system.This area has been landscaped to include different textures and materials and finally planted in a style to complement the theme of heat and sunshine. The Cathedral Garden – red twigged limes (Tilia platyphyllos Rubra) are pleached to form a formal area. Hosta Walk and Pergola – there are few areas of shade in the garden, on the north side of the house hostas and ferns grow well. The rose covered pergola is a blaze of colour and highly scented in June and July. Roses include Rambling Rector, Wedding Day and Veichebleu. Potager – edged in box this area is planted with vegetables for the house. We garden this semi-organically on a 4 year rotation and farmyard manure is used as fertiliser. Thyme Walk – leading off from the pergola is a paved walkway planted with thymes leading to the north gate which opens onto the lavander walk. The Urn Garden – this garden is planted with a small collection of peonies now starting to flower well and benefiting from the shelter of the yew hedging. The Dutch Garden – a pathway of granite setts leads though a garden of tom pots planted with hyacinths in spring. Agapanthus give a South African theme in the summer with summer bedding in the pots. This section was started in July 2006 from a grass paddock. During its preparation the Pindle Pond was excavated, a damp area was created along the spring line and the surplus soil material was placed on the slope to ensure the site looked as natural as possible. We moved over 2000 tonnes of soil and subsoil before the area was seeded and the following areas were created. The Slate Monolith terrace – a contemporary area which links the formal garden to the hillside area via a set of steps. 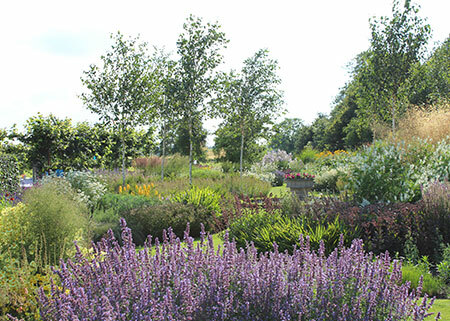 The Lavender Walk – a grass walk edged in a selection of different lavenders. The Obelisk Garden -enclosed by more red twigged limes which are being pleached. The central lawn is edged with a light pea gravel to complement the dramatic obelisk in the middle. 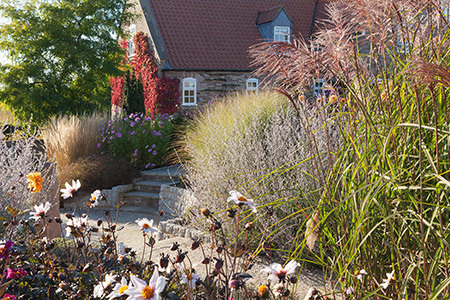 The Prairie borders – a meandering grass path leads through deep herbaceous borders which are planted with bold clumps of planting which like the dry sandy soil in this area. Big drifts of Achillea and Salvia contrast with Coreopsis, Verbascum , Peroskia, Sedum Rudbeckia and Helenium to give a striking mid summer display. Take a few minutes or longer to sit and enjoy the views across the open countryside. The Wild Flower Lawn – a new area under development which over the next few years will develop into a rich tapestry of wild flowers. In spring a mix of daffodils will give an extra dimension. The Hay Barn Meadow – more areas of wild flower meadow welcome visitors. In the early spring snowdrops crocus and naturalising daffodils create a wonderful display. The Damp Valley – this area is a very wet and spring fed. 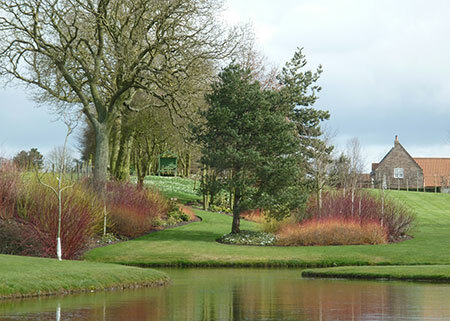 The steep bank has been planted with a selection of dogwoods and willows to stabilise the ground these will be cut hard back each Spring to enable the visitor to view the damp garden – mass planted with Siberian and Japanese Iris , Astilbe, Rodgersia, Gunnera, Caltha, Darmera and Primula. The Grass Bank – planted with crocus starts the season and is followed by a dazzling display of snakeshead frittilaries and summer snowflake. This meadow area is allowed to grow long so as to create a summer meadow framing the lawn. The Winter Garden – the northern boundary of the garden is bounded by a shelter belt of trees and shrubs which gives way to a shaded meadow area where snowdrops and english bluebells are slowly establishing. This leads onto a wide grass path which meanders through shrub borders giving a wonderful view down to the water’s edge of the Pindle pond. You now leave the main garden and enter the wildflower and woodland areas. 1st Wildflower Meadow – this was sprayed off grassland and oversown in September 2007. The meadow meanders through the new woodland and is after 10 years developing into a diverse and enchanting meadow. The two meadow areas were planted with 700 native tree transplants in 2006 which are createing woodland areas which will enhance the area as a habitat for wildlife. We have also planted a selection of specimen trees to give additional interest. We have planted approximately 100,000 native bulbs. The native narcissi (Narcissus oblivaris and pseudonarcissus), flower with improving vigour each Spring and are now starting to seed around. Snowdrops and english bluebells are also planted through the meadows. 2nd Wildflower Meadow – this was arable land seeded in 2006 and is slowly improving in diversity as we add more species of wildflower by overseeding. Yellow rattle and annual haymaking is gradually reducing the vigour and fertility of the grasses and soil. The Far Pond – this pond was created about 25 years ago – the banks were sown with a wildflower mix and left alone until 5 years ago when the banks were cut and managed. There is a good establishment of wildflowers and we have further enhanced this area with marsh orchids and frittilaria. This area is a haven for wildlife which we hope to develop further in the next few years.